November 2016 Monthly Feature: Arizona Paranormal: The ABCs of EMFs and EVPs, Maybe it's allergies! The ABCs of EMFs and EVPs, Maybe it's allergies! Doing a monthly article about the paranormal is an exciting new adventure for me, and I am happy I was able to introduce myself to you all last month. I am looking forward to writing about all the historical haunted places around Arizona, my personal experiences, and so much more. Now some people will automatically think the paranormal deals with just ghosts, but it goes way beyond that. The paranormal deals with ghosts, UFO's, Bigfoot, Loch Ness, psychic abilities, etc. There are different groups that will specialize in each field too, the field I deal with the most happens to be ghosts. Although, they all interest me and I would love to learn as much as I can about each one; my experiences have all dealt with spirits and sensing things that can not be seen. I have to say I have had a lot of experience with the paranormal with ghostly activity. Being raised in the haunted house and being able to sense things others couldn't give me more of an edge for this field, but I am not an expert. In fact, there are no experts in the paranormal field because a lot of it is theories and we are still trying to find the answers. We try to be as scientific as possible with having evidence to prove what we saw, felt, and heard; but to some even the proof will never be enough. We do however have a few scientific terms we use in ghost hunting, such as EMF and EVP. EMF stands for electromagnetic field which is a physical field produced by electrically charged objects and spirits are known to be able to affect this field, which is why they use EMF to try to detect their presence. EVP stands for electronic voice phenomena and these are the voices of the spirits that are recorded with a simple recorder. This is where most evidence usually comes into play, I know I have received some class A EVP's which means you know without a doubt what has been said and it is very clear. I bring these two terms up because they are the ones most don't understand about and the ones we refer to the most in the ghost hunting field. I am sensitive to EMF's, which aren't always ghostly related. Some people can have high EMFs due to exposed wiring, large circuit boxes, or overhead power lines nearby. High EMF's can cause some side effects and one is the feeling of being watched and more. 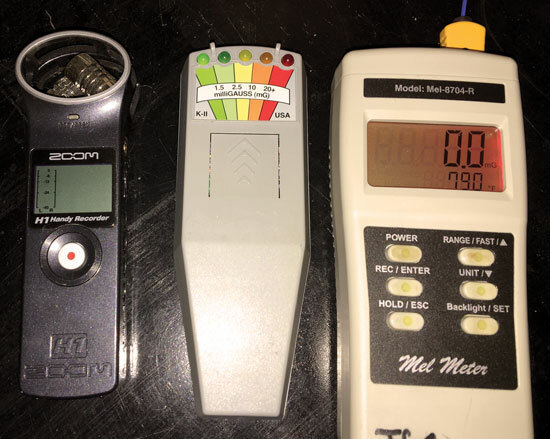 I always can tell when I am around high EMF's I can feel it, it's hard to explain but some people have the sensitivity to it and I do so one of the first things I do is check if it is human caused (wiring, circuit boxes, etc), if it's not then that could mean I am in the presence of a spirit. To me I will feel off balance and kind of dizzy is the best way to describe it. I haven't always been like that, though, but I have always known when I was being watched. One of my first experiences as an adult was in Toledo in an apartment I lived in. I was always feeling like I was being watched and uncomfortable in certain areas of my home. This was before I knew what to do and how to handle a haunting, so I just tried to ignore it, but one night I couldn't ignore it anymore. I was home alone when I heard a loud bang, so I went to find out what caused it. I went around the whole apartment when I went into the living room I saw what had happened. There was broken glass on my floor, a picture had fallen out of the frame, but when I looked up at the picture frame it was still on the wall but it had flipped! The frame on the wall was flipped! I could see the hook you use to put it on the wall! How did that happen? How did a frame flip on a wall and break? I always knew there were things I didn't understand completely but this was something that really made me start to wonder. I only wish that I knew back then what I know now because I would have gotten out a recorder and started asking questions, but these experiences and my sensitivity is what fuels my passion for this field. I am always wanting to find the answers and always loving the living history to all these places and homes and I look forward to sharing them all with you. 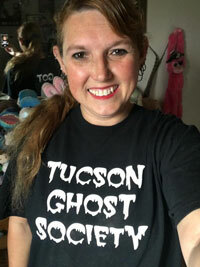 I hope you will all follow my monthly articles to hear about all the history and haunts of Arizona. from resident cases to well-known businesses. I have seen shadows, black mass, and caught some great EVPs. Like the one that was sarcastic and said: "Maybe it's allergies!" I will talk about that case in next month's article! Just remember till then, we are never truly alone!